On 17 October, 2002, the subsidiaries of ITE (Holdings) Limited, ITE Smartcard Solutions Limited and ITE Engineering Limited, were successful accredited with the ISO9001: 2000 Certifications. 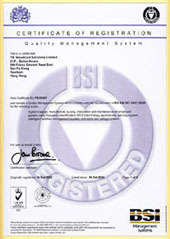 The ISO9001:2000 Quality Assurance System audit was carried out by BSI Management Systems on 1 August 2002. To have a continuing assessment, BSI Management Systems keeps on asessing the Quality Assurance System in both subsidiaries while the continuing assessment visit on 5 May 2003 have just been passed. We are pleased to announce that we have achieved our ISO Certifications within the timetable set forth in our Statement of Business Objectives of our IPO prospectus which is a clear reflection on the uncompromising commitment of ITE towards professional management and quality assurance. ISO 9001 Quality System is an international standard for quality management systems. It helps to manage the entire business effectively. The aim of the system is to enhance customer satisfaction through effective application of the system and continual business improvement. Companies applying the system should be able to demonstrate a superior ability to provide products and services to meet customer and applicable regulatory requirements constantly. QUESCO Information Services Limited (QISL), the specialist IT Professional Services arm within our subsidiary the QUESCO Group has successfully completed many application software development and implementation projects for clients in the major corporate, institutional and government sectors in the Hong Kong SAR. For projects undertaken and successfully completed for clients such as the Hong Kong Government we have adopted the quality control, project management and assurance standards and procedures as directed to comply with the required policies and standards established as a pre-requisite of service by the Information Technology Services Department (ITSD). - SSADM (Structured Systems Analysis and Design Methodology). 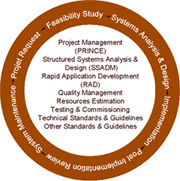 - PRINCE (Projects in Controlled Environments). - FPA (Function Point Analysis). - RAD (Rapid Application Development). - SMC (System Maintenance Cycle). - Other standards and guidelines required for successful project completion. QUESCO Information Services Limited (QISL) is currently initiating the implementation of a Capability Management Module (CMM) set of practices that will serve to compliment these existing quality standards and enhance the overall quality of service provided. We intend to achieve Capability Management Module (CMM) Level 2 certification by the 4th quarter of 2004.